What Does It Cost to Advertise On TV? I am asked every single day something that I call the "Magic Question" - What does it cost to advertise on TV? In reality it is a very complex question to answer. It involves figuring out exactly what it will cost to produce your commercial and what your expectations are for it - and then what station, time and scope of campaign you would like to have put together for you. Add all of this up and you have the answer to "What it will cost to advertise on TV". To get a better understanding of the costs associated with advertising on tv, I suggest checking out this article. If you are a business owner and looking for some solid answers right now as to the cost of advertising on TV for your business, please give me a call at (231)468-9972 or email tony@televisionadvertisingexperts.com . After learning a bit more about your business I will be able to give you an exact estimate on what a television advertising campaign would cost. A few years back the "big" thing that facebook was encouraging and marketing to businesses was "to create a fan page." Through this page, a business could build a following of opt-in fans that could then see the posts of the business and participate in threads started by the business. Then in early 2011, with the flip of a switch back at the 'ol fackbook plant - It appeared as though something went horribly wrong for virtually all business "fan pages". View counts on new posts plummeted, comments died out and posts from brands were suddenly reaching a fraction of the eyes that they once reached? Now we know. Facebook appeared to be getting ready to launch "promoted posts". Basically a way for you to pay them to reach the fans that you likely already paid to get - and who were willingly asking to hear from you. But now according to the "promoted post" option on facebook ... If you want to do that in almost any scalable form that will cost you. As a marketer, this to me seems like very bad business. Its the equivalent of purchasing a radio or TV commercial, buying the air time on a radio or TV station and then suddenly before its about to go to air - the radio station call you up and wants to charge you extra to keep the transmitter on so you can "reach" the people that you've already spent so much time, energy and money gathering the attention of and paying to reach. The value of having a huge fan base on facebook has plummeted in the process. "Likes" or "Fans" are no good if you can't reach them, or if you have to pay more to reach an existing base of followers that you very likely already spent money on getting. Keep in mind, facebook already offers paid ads for business, but that doesn't seem to be enough to make them happy. They now want to take what many hungry businesses spent money growing (through facebook ads) and now charge a second time them to eat the meal they already bought. And charge a new fee for every single bite. While this may be doable for Pepsi, the average medium or small business - (who would most likely have more of a personal connection with their audience to begin with - THAT CHOSE TO FOLLOW THEM) doesn't have $20 - $100 to shell out every time they want to post and actually reach the followers that they have gained. Sorry facebook, a move like this that truly gives the middle finger to small business is another reason NOT to move further away from your erratic marketing schemes. Maybe soon the old chain email about "charging" for an account will also come true. Only time will tell. Tony is a professional marketing and advertising expert in the areas of radio, TV and web. Visit http://www.bestradiocommercials.com or http://www.televisionadvertisingexperts.com for more on his services. Is Advertising On The Radio Effective? If there was a medium out there that had a listener base of more than 94% of the population, you would certainly consider it a very effective medium. Wouldn't you? Does a medium like that actually exist? At this day and age there are so many mediums that bombard the consumer with advertising messages, how on earth could one medium still command such a large audience? How could such a medium command and engaged audience? Sure it's easy to "pop up" every now and then in front of someone, but any sort of advertising medium needs to have a way to engage with that viewer or listener if its going to be effective. You would think that a medium like that, that reached such a large percentage of the population would be extremely expensive to advertise on. It would also very likely be out of reach for most small and medium-size businesses, right? Wrong. The medium that I'm talking about does exist. The medium is radio advertising. Recent studies actually show that radio listenership is on the rise. CDs are slowly disappearing out of people's cars, and the frustration of creating that perfect "playlist" is losing its novelty effect. People are going back to a pre-programmed way of listening to music and using the medium as a way of escaping the stress of daily life as they commute to and from work. Often times a radio will be played from a web stream or a box on a desk during work hours, or just in the background at home. The fact of the matter is that radio reaches more people than almost every other advertising medium out there. Sure it has its pros and cons, but with more radio stations out there than ever before it also remains one of the most targeted mediums for reaching a select clients. It is also very affordable. When you compare all the options available to the small or medium-size business today, radio continues to come in is one of the most low-cost options when you consider the cost of reaching one individual listener at a time. (cost per thousand or cpm). It often times breaks down to just pennies. This translates to being 10x to 100x cheaper than other mediums. Radio lives and breathes by delivering long-term results and maintaining relationships with its clients. 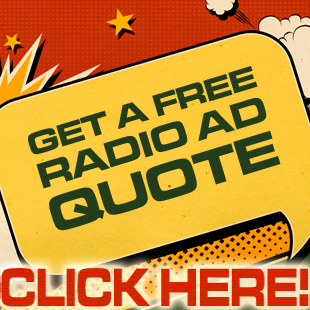 Radio only works for the "radio station" if its advertisers are happy. Often times radio stations will throw in "added value" options such as extra commercials or promotions to support a commercial schedule to help ensure a positive experience for its advertisers. The flexibility the medium and targeted focus have made it a top choice for advertisers since its inception years ago. To have all of your questions about radio answered, feel free to call me or email me direct. My direct line is (231)468-9972 or you can email at tony@bestradiocommercials.com or visit my radio commercial website here. Share This Info With Your Team! (c) 2010 V MARKETING & MEDIA INC - CALL 231.468.9972 - http://www.bestviralmedia.com. Simple theme. Theme images by Barcin. Powered by Blogger.